Front facade, Belgrade Theatre, Coventry. Donald Gibson, 1958. Photo: Alistair Fair. Elevation to Corporation Street, Belgrade Theatre, Coventry. Donald Gibson, 1958. Photo: Alistair Fair. 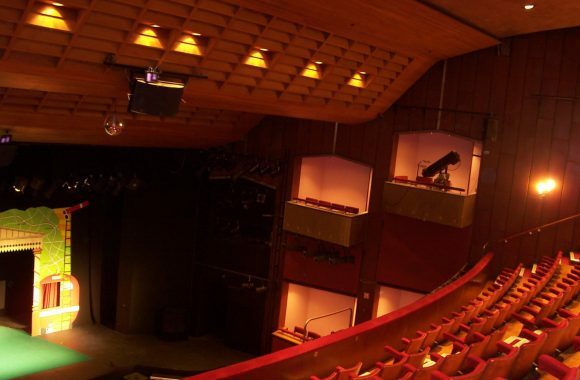 Foyers, Belgrade Theatre, Coventry. Donald Gibson, 1958. Photo: Alistair Fair. Auditorium, Belgrade Theatre, Coventry. Donald Gibson, 1958. Photo: Alistair Fair. Sixty years ago, the theatre critic Kenneth Tynan saw the completion of the Belgrade Theatre, Coventry, as the beginning of a new era. ‘Enter most theatres and you enter the gilded, cupidaceous past’, he wrote. ‘Enter this one, and you enter the future.’ Opened at the end of March 1958, the Belgrade was the first all-new, permanent professional theatre to be built in Britain since 1939. 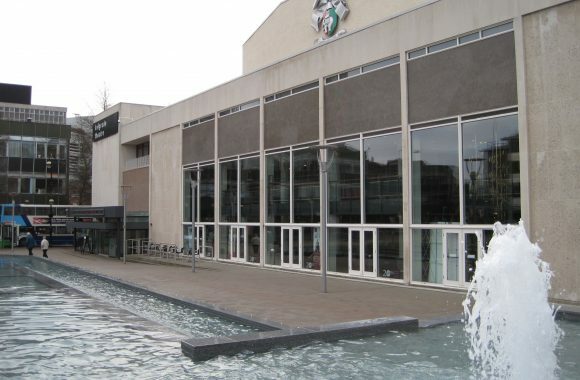 Not only that, but it was also Britain’s first purpose-built civic theatre, having been conceived, designed, and funded by Coventry City Council. Its contemporary architecture contrasted with older theatres and embodied the progressive principles which underpinned its creation. The Belgrade’s status as a civic venue recognised the changing status of the performing arts in post-war Britain. Theatre had hitherto been an essentially commercial activity, but after 1945 was partly co-opted as a ‘cultural’ element of the Welfare State. The Arts Council of Great Britain was founded in 1945. 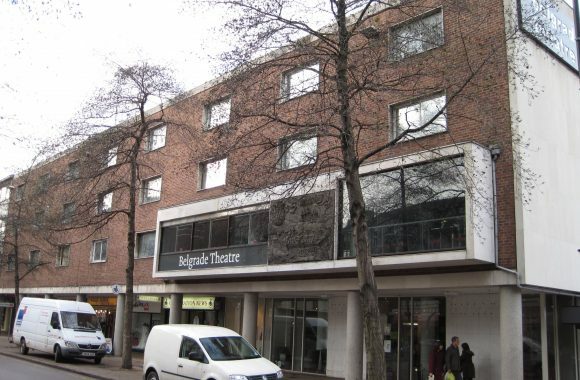 By the 1960s it was financially supporting not only the practice of theatre but also the construction of new buildings. The Local Government Act of 1948, meanwhile, allowed authorities like Coventry to subsidise the performing arts from the local ‘rates’. The sums were small, but re-cast theatre as a public amenity, akin to museums and libraries. In a period when it seemed that Britons were ever-more affluent, with growing amounts of leisure time, the argument was frequently made that theatre – especially mixed-programme, regional Repertory theatre – was a productive form of recreation. In Coventry, the authorities were concerned that the city’s inter-war growth had not been accompanied by the provision of leisure facilities. A theatre would be a community focus whilst also encouraging a culturally-aware form of citizenship. It also addressed Coventry’s international outlook, with the Belgrade’s name reflecting Coventry’s links with Eastern Europe. These links were the product of the city’s wartime experience as well as the solidly Labour politics of Coventry City Council. A substantial gift of timber was received for the theatre from Yugoslavia, although much of the wood apparently proved unsuitable and was used elsewhere. The Belgrade was realised as part of the wider rebuilding of Coventry city centre after 1945. Its modern architecture firmly embedded it within the broader programme of municipal-led reconstruction. The layout was essentially complete by late 1954, when the City Architect, Donald Gibson, left Coventry for Nottinghamshire. In the following months, refinements led to the building originally proposed for the adjacent site being omitted, allowing the creation of a public square and a more prominent public face for the theatre. The theatre design draws on a range of precedents. The block of shops and actors’ flats (an innovation) facing Corporation Street reprises Ralph Tubbs’ Indian students’ hostel in London. The Belgrade Square elevation, meanwhile, evokes the materials and forms of the Festival Hall, which was the only major arts building to have been built in Britain since 1939 and was similarly a ‘civic’ project. Internally, the theatre’s foyers are shared by all patrons rather than being segregated by ticket price, as was typically the case in older theatres. In addition, they were to be open all day for refreshments. 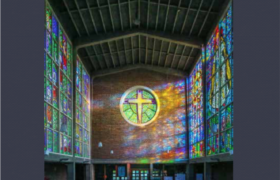 Art formed an integral element of their design. 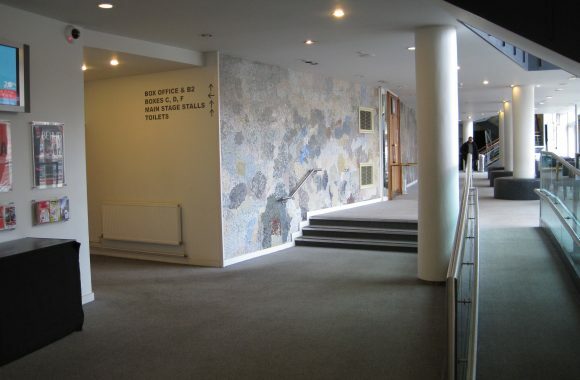 Martin Froy’s mosaic, ‘Four Seasons’, covers the long wall of the foyers on both levels. 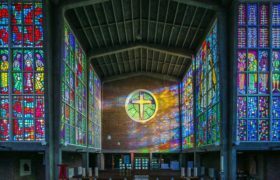 It was intended as an indeterminate backdrop to the gathering audience, whose presence and movement was understood to complete the design in an example of the kind of ‘modern monumentality’ promoted by the theorist Sigfried Giedion. Chandeliers by Bernard Schottlander reinterpreted theatre tradition in modern form. The Belgrade’s auditorium surprised some on account of its relatively traditional form. It is arranged on two levels, with stalls seating, a balcony, and Festival Hall-like side boxes. A traditional proscenium-arch stage was provided, despite emerging debates about the potential of non-proscenium forms. Yet the space was conceived in ‘modern’, even democratic terms. Good sightlines and acoustics for all were emphasised, memorably at a test performance when Gibson’s replacement as City Architect, Arthur Ling, fired a gun on stage in order to demonstrate the acoustic properties of the theatre. The Belgrade quickly gained a reputation for the quality and innovative nature of its productions. Having been extended and sensitively refurbished by Stanton Williams Architects in 2005-7, it is now listed at Grade II. Conceived as a civic amenity of cultural value for all the citizens of Coventry, it remains a prominent fixture in a city which was recently awarded the title ‘UK City of Culture 2021’. Dr Alistair Fair is Lecturer in Architectural History and Chancellor’s Fellow at the University of Edinburgh. His book, ‘Modern Playhouses: an architectural history of Britain’s new theatres, 1945-1985’, will be published by Oxford University Press in April 2018. You can follow Alistair on Twitter @AlistairFair.